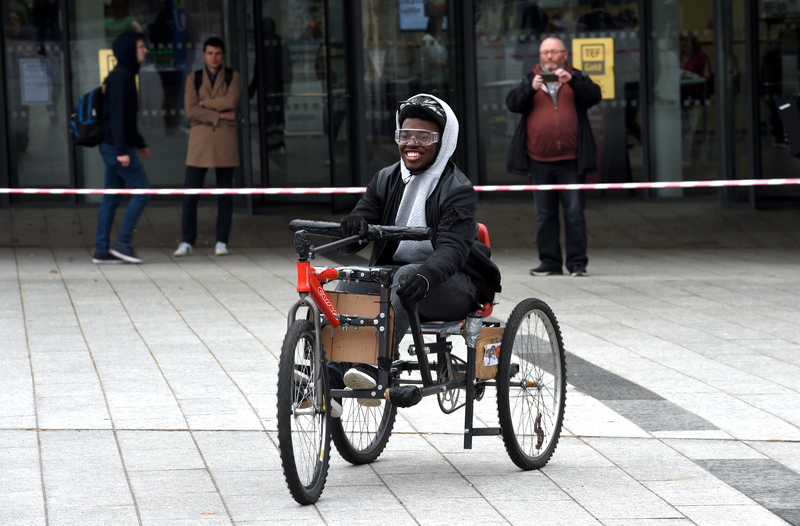 Pictured are students during the kart time trials held outside the Sir Ian Wood Building, RGU, Aberdeen. 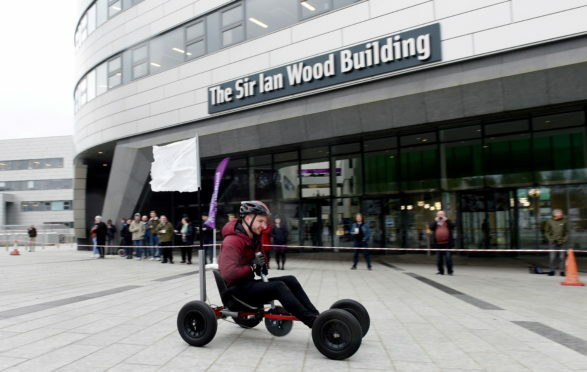 Nineteen teams of budding mechanical engineers from Robert Gordon University were tasked with building their own kart as part of a 3rd year graded project. Each had a £200 maximum budget and three attempts to complete a carefully planned route, weaving through obstacles that tested their manoeuvrability, brakes and steering. The eventual winners coasted round the course unscathed in an impressively speedy 35 seconds. Dr Morgan Adams, module coordinator at RGU, said the day had been “absolutely brilliant”. He said: “At the end of the day, it’s exactly what university life should be all about. “Engineering is applied physics. It is a fun subject and this is a great way to show that it isn’t all about lecture theatres. The winners on the day were team “Eez Nuts” with “Car Crash Carnage” in second and “Mercedes” in third. Dr Adams added: “One of the hardest tasks is to actually keep within the set budget, so we encourage all the teams to use as much recycled material as possible. “Some teams had even used old tumble-dryer panels while others used parts from old bikes. “The winners fabricated the big sprocket themselves and finished two weeks early, which gave them time to help other teams who hadn’t quite finished. 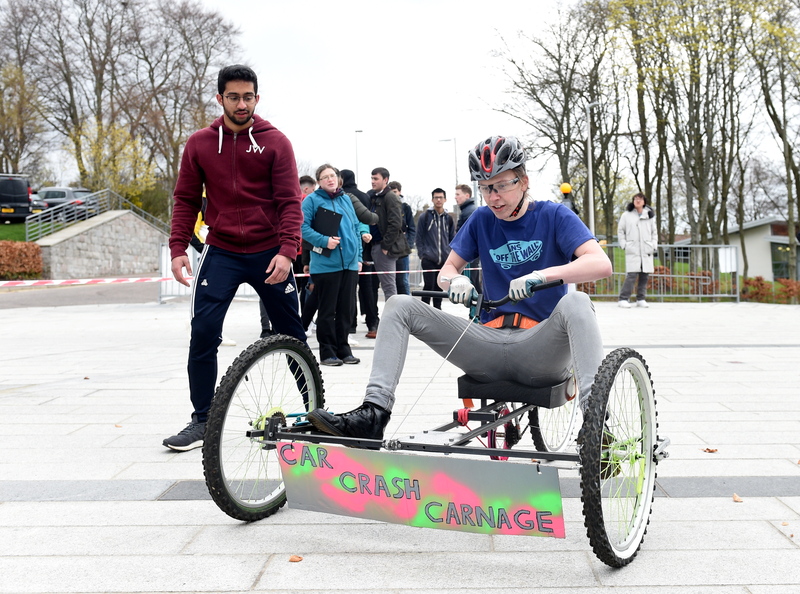 The annual race has evolved from designing and racing land yachts on Balmedie beach to this year’s spectacle on the modern Garthdee campus, something Dr Adams describes as “a great advert for the course, university and everyone else who can now watch it”. The event was sponsored by Aramark, who provided a free BBQ for the students, and CBRE, who provided the day’s prizes.